Thanks to all of the Granges who sent in resolutions to this last session. We had some very interesting conversations on a variety of topics. We saw resolutions concerning restructuring the State Grange by eliminating or realigning the Pomona Grange structure. These were not adopted by the delegates but they did bring this topic to the limelight for our members to think about. How well is the present structure working? The delegates also voted in favor of eliminating the Camp Berger Board of Trustees. The State Grange Executive Committee would now be managing the camp business. There were a few cost savings resolutions. One will affect the delegates to future sessions. The delegates voted to eliminate the per diem payments per session and mileage reimbursements for delegates, committee members and officers as a way to reduce the cost of the state convention. The delegates also sent a recommendation to National Grange to eliminate paying for the cost of travel, meals and lodging for non-essential staff and honorary delegates at the National Grange Session. 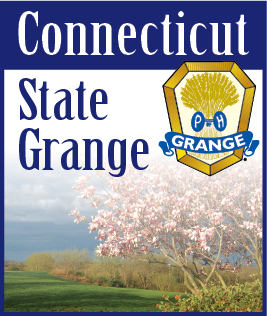 This last year many State Granges were becoming concerned on the handling of the finances by the National Grange so the delegates opposed the pending $2.00 per member dues increase. They requested that the National Grange place adequate financial controls to improve its current financial position. We saw a couple of safety issues addressed. One resolution recommends that animals not be allowed to sit in the driver’s laps of motor vehicles while the vehicles are in motion. They also requested that animals be restrained in an area away from the driver. Another resolution asked that handicapped rooms be available on the ground floors. They were concerned about minimally mobile persons being trapped in upper floors without adequate ways of evacuating the building. There were a couple of driver safety resolutions that were adopted. One asked that highway billboards be designed to be easier read with larger fonts and to control the flashing of lights on them. The other resolution was concerning the signage at the intersection of I-95 and I-395. A couple of recommendations were adopted for projects for individual Granges to participate in. The delegates asked that Granges that have their own halls participate in a National Heritage Day. They also supported the placing of bat houses to promote the welfare of the state’s bat population. Another GMO issue appeared with the delegates asking legislators to address the issue of liability for the contamination of non-GMO and organic fields. Many times these fields are contaminated with seed that is unintentionally deposited by wind and other means. There have been lawsuits by bio-tech companies which hold the patents on the GMO seeds. The resolution asked that the cost of these suits be borne by the companies and not the farmers whose fields were contaminated through no fault of their own.